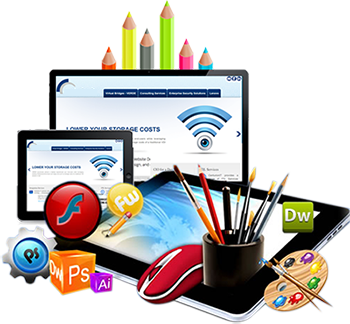 Our team of visual web developers has the capability of delivering high quality work within a desirable timeframe. The availability of high end verticals like PC and MAC based facilities, educational asset library for content creation and high-tech fully integrated Multimedia Productions studio facilitates work process in a major way. The array of corporate graphic designing solutions covers everything, starting from business logos to cards. Our designers have the necessary resources to bring the desired solution. Each and every designer participates in periodic training sessions in order to find out and comprehend global trends in graphic designing, multimedia disciplines and the evolving preferences of clients across the globe. Thanks to the meticulous approach of recruitment followed by us, we are able to rely on our team of designers to pull off both simple and complex business needs with ease. Our expertise can be accessed within competitive price brackets. We guarantee graphic designing solutions tailored to meet your business needs to the tee. Contact us today! We will present you with samples of our previous works.